Megan, Stackla and Scotland’s National Tourism Board came up with a truly inspired concept for marketing travel to Scotland for Millenials. Tell me about the world’s first instagram travel agency. In October 2017, Scotland’s National Tourism Board opened the #ScotSpirit Instagram Travel Agency in London, just in time for holiday season travel planning. 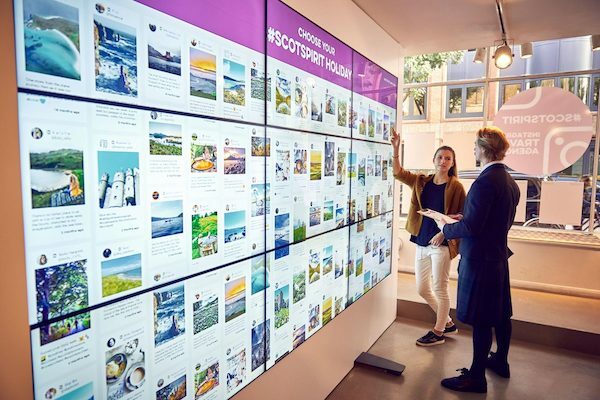 It was a temporary, pop-up travel agency, which used floor-to-ceiling digital screens displaying hundreds of Instagram photos from across Scotland to inspire potential visitors. So instead of walking into a travel agency with artistic posters on the wall of several destinations, plus brochures, and catalogs, millennial travel planners could see photos from real people just like them in a popular nearby destination. VisitScotland staff are then there at the pop-up to help interested travelers plan a personalized itinerary, based on what they’re seeing. Visitors could view the display of Instagram pictures posted by real travellers—including Scotland’s lush landscapes, fun sights and experiences, tempting restaurants, cozy hotels—and pick their favorite areas of interest. The staff then used these images to help travelers create their ideal Scottish holiday itinerary. Sounds like a terrific idea! How did it come about? Travel agencies as we once knew them have kind of become a thing of the past, haven’t they? Today, more and more people, millennials especially, are influenced by digital experiences and the opinions and reviews of their peers. Our 2017 consumer content report showed that 97 percent of millennials say they would share a positive travel experience on social media. 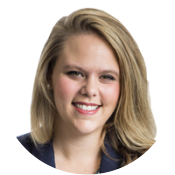 57 percent of Millennials have made travel plans based on social media images or videos they saw a friend post. So in short, social content—what we call user-generated content or UGC—is the new travel agent. VisitScotland realized this as well. Knowing that 92 percent of consumers trust earned media above all other advertising, and having used Stackla to incorporate UGC into their website and visitor center digital screens around Scotland, they came up with this unique concept for creatively displaying real people’s experiences of being in Scotland via a pop-up shop. So tell me … What was the response? VisitScotland has enjoyed a multi-layered positive response to their use of UGC through Stackla. During the week of the temporary pop-up Instagram travel agency, VisitScotland saw a spike in their number of Instagram followers. Their average follower net growth increased by 37 percent from August and 23 percent from September. In addition to that, Scotland’s tourism board enjoyed a PR success. They saw over 192 pieces of coverage generated, with highlights including the BBC and London Evening Standard. And overall, since using Stackla to leverage UGC throughout their multi-channel marketing strategy, overnight visits to Scotland by London millennials grew by 34% between 2013 and 2016. I look forward to hearing their results for 2017. I do know VisitScotland hopes to keep using UGC going forward to help deliver authentic inspiration to millennial travellers. Check out the full case study by our partners at Stackla.